CARACAS, April 20: Venezuela's opposition is looking to keep up pressure on President Nicolas Maduro by taking to the streets again Thursday hours after at least two people were killed and hundreds arrested in the biggest anti-government demonstrations in years. Tens of thousands of protesters demanding elections and denouncing what they consider increasingly dictatorial government were met by a curtain of tear gas and rubber bullets as they attempted to march to downtown Caracas on Wednesday. Dozens even had to slide down a concrete embankment and into the Guaire River to escape the noxious fumes. Across the country the clashes were intense. Pro-government militias, some of whose members were armed, were blamed for the two deaths, including that of a teenager in Caracas who was heading to a soccer game with friends. In several cities, protesters described being terrorized by militia members, some of them armed and circling the protesters in motorcycles. 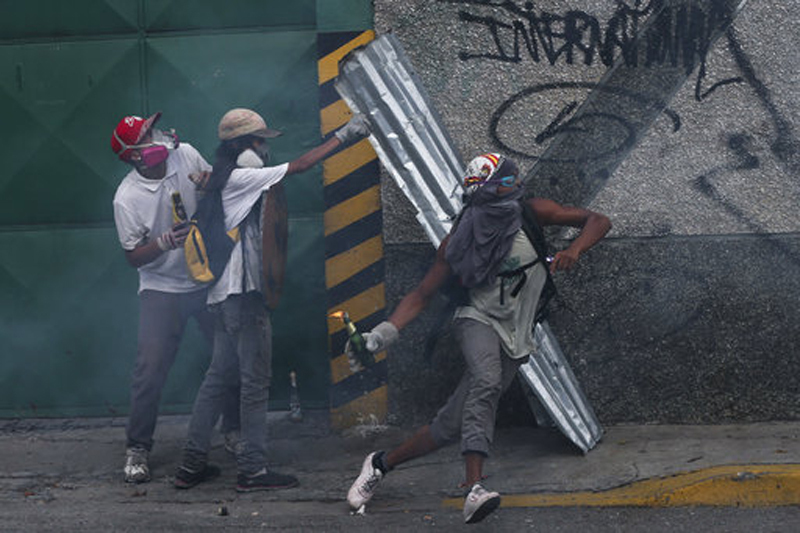 As night fell, a group of youths tore down signs and billboards to build barricades from which they threw Molotov cocktails and rocks at riot police. The two killings bring to seven the death toll since protests began three weeks ago over the Supreme Court's decision to strip the opposition-controlled congress of its last remaining powers, a move that was later reversed amid a storm of international criticism. As protesters with burning eyes headed home the opposition called for another round of street demonstrations Thursday. "If today we were millions tomorrow even more of us need to come out," said opposition governor and two-time presidential candidate Henrique Capriles, who last week was barred from running for office for 15 years. Opponents are pushing for Maduro's removal through early elections and the release of scores of political prisoners. The government last year abruptly postponed regional elections the opposition was heavily favored to win and cut off a petition drive to force a referendum seeking Maduro's removal before elections late next year. The opposition sees the government measures as turning Venezuela into a nearly full-blown dictatorship. But the government has shown little interest in backing down. Maduro, addressing supporters at a much smaller but still large countermarch of mostly state workers, said he was "anxious" to see elections take place sometime "soon" and repeated his call for dialogue, something many in the opposition see as a stalling tactic. 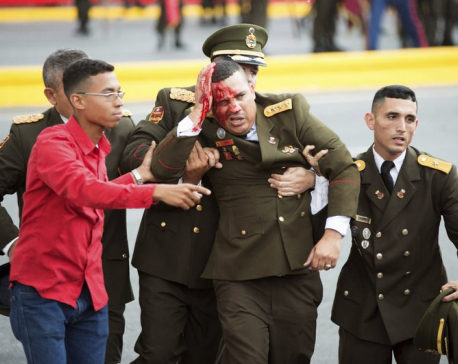 "Today they attempted to take power by force and we defeated them again," said Maduro, adding that in recent hours authorities had rounded up several armed opponents seeking to carry out a coup. He didn't provide any evidence to back up the coup claims, and the opposition rejected them as desperate attempt to intimidate Venezuelans from exercising their constitutional right to protest. As tensions have mounted, the government has used its almost-complete control of Venezuela's institutions to pursue its opponents. On Wednesday alone more than 500 protesters were arrested nationwide, according to Penal Forum, a local NGO that provides legal assistance to detainees. It was unclear how many remained in custody. Foreign governments are also warning about the increasingly bellicose rhetoric coming from the government. The U.S. State Department said those who commit human rights abuses and undermine Venezuela's democratic institutions would be held accountable. Opposition marchers included Liliana Machuca, who earns about $20 a month holding two jobs teaching literature. Although she doesn't expect change overnight, she said protesting is the only option the opposition has against an entrenched, increasingly repressive government. "This is like a chess game and each side is moving whatever pieces they can," said Machuca, her face covered in a white, sticky substance to protect herself from the effects of tear gas. "We'll see who tires out first."